The provisional figures of 2014 show that the Port of Amsterdam handled more than 34.4mt (million tonnes) of dry bulk, writes Barry Cross. Although this was a rise of only 1% compared with the 33.7mt handled over the same period in 2013, Lex de Ridder, who takes care of the energy cluster in the port authority’s commercial division, believes that this is a really good result, compared to figures being posted by rivals. Only Rotterdam, he notes, is having a similarly good year in north- west Europe. Given the relatively stable market position, some commodities being handled by the port nevertheless remain sluggish, while others continue to do really well, with coal very much leading the way. In fact, while 2013 broke all existing records for coal handling, so far, tonnage reported for 2014 has been even higher, up around 7% on the year. De Ridder points out that it is not a coincidence that Rotterdam is also showing growth in coal handling, prompting him to speculate that the two Dutch ports’ superior inland waterway connections are resulting in north-west Europe coal imports being consolidated there. “As for 2015, coal tonnage will not continue levels of growth seen in the last two years, although we remain confident that we can hang onto existing traffic levels for the foreseeable future,” he says. three main providers of coal for Amsterdam-based importers. However, the market downturn in China has resulted in producers in South Africa now shipping to the Netherlands, too, while Amsterdam has handled shipments for the very first time this year from both Indonesia and Australia. Russian exporters, nowadays, appear to view Amsterdam as their main regional hub, one which can serve customers in both north and south Europe. Furthermore, given the growing importance of blending, which is often requested for Russian shipments, Amsterdam has the equipment in place to do this, helping to consolidate its current healthy position in this sector. The largest coal shipments arrive in 170,000dwt vessels, although these cannot access the main port without being lightered outside the locks. This task is currently done by floating cranes on the approaches to the port, at IJmuiden, where the port authority maintains a capacity of up to 2mt annually. Here, coal is mostly transshipped to barges, which then wind their way along the inland waterway network to destinations in Germany. deployment of a new system of ‘water curtains’ around the floating cranes to prevent dust emissions causing distress to the more than 300,000 local inhabitants. “Now that we have the necessary permits in place, lightering activities at IJmuiden will increase notably, with additional coal business generated, we hope, by importers in the UK, who will benefit from these enhanced operations outside the locks,” says de Ridder, noting that the UK used to be a major customer of Amsterdam’s for this commodity. He concedes that getting the necessary permits to boost coal traffic on the approach canal has not been easy, because of environmental concerns. Residents, for example, already have to live side-by-side with the former Corus steel plant at IJmuiden, which is nowadays operated by Tata Steel. In addition, there are regular flows of coal inbound to serve the NUON/Vattenfal power plant, which consumes about 1.5mt of coal annually, and which should continue to operate at least for the next 20 years. Yet despite projections of an eventual drop off in coal traffic, de Ridder remains confident that coal will remain a major commodity for Amsterdam for the next few decades, particularly if the enhanced lightering activities do boost trade with the UK. “Germany, also, will have to continue importing coal to replace the generating capacity lost following the closure of its nuclear plants.There was some suggestion that gas-fired stations would benefit, but the high price of gas is making coal more attractive, at least in the short term,” he says. One of the commodities that might eventually displace coal is biomass. Wood pellets are being imported as a growing rate, with a large, specialist facility able to handle this already in place at the port. However, pellet handling is generating large-scale investment, with several smaller installations also being developed close to the port. At present, consignment sizes dictate the deployment of Handysize vessels of up to 50,000dwt. Even more intriguing is the current upswing in the handling of municipal and industrial waste, which has the potential to become a major new money spinner for the Port of Amsterdam. The majority of this is imported from the UK, with around 300,000 tonnes of waste being currently processed by specialist facilities. One of the world’s largest and most advanced incinerators is located close to the port, although the owners are unable to source sufficient waste from the Netherlands alone, so have gone further afield, signing contracts with companies in the UK, where appropriate processing plants are not yet in place. “The handling of waste, which only began three years ago, is now growing in importance and tonnage is forecast to increase in the future,” says de Ridder. Continuing the recycling theme, a new scrap terminal opened earlier in the year, which he says is currently doing “quite well”. Operated by ALBA, it has effectively doubled the amount of scrap that was previously handled, much of which is sourced in north-west Europe, processed in the port, then despatched to steel producers in both Turkey and China. Indeed, such is the importance of this traffic that consignment are invariably sent in 80,000dwt Panamax vessels. Another commodity flagged up for future growth is minerals traffic, because this is a sector where Amsterdam has yet to make a big impact, says de Ridder, who points out that his optimism is predicated on signs that some companies in the port are definitely trying to further develop this market. Cocoa is also an up-and-coming commodity, with Amsterdam already the world’s leading port in the amount of tonnage handled, thanks to a possible large investment in processing facilities by a leading provider of LME warehousing and logistics services. Should the negotiations lead to a positive closing, the investment will result in 70% of inbound consignments being processed locally. Today, of the 30mt of dry bulk being handled by the port, just 3.7mt are exported. In the past, while exports probably accounted for about 20% of dry bulk traffic, Amsterdam remained a net importer. And that is a situation that is unlikely to change any time soon. In terms of capacity, de Ridder says that Amsterdam has enough to cope with existing dry bulk traffic and also sufficient to absorb growth. The port authority plays a crucial role in maintaining this healthy position, he adds, noting that a close eye is kept on how well terminals are coping with traffic levels. As and when they are required, new quays are also put in place, he says. OBA, for example, requested the port authority for more space, so 12ha was transferred to its concession from EDF/Rietlanden, permitting it to revamp the layout of its now 70ha facility to make it more efficient, thereby boosting capacity. However, by far the most important investment in new infrastructure is the new lock, being built alongside the existing one on the approaches to the port. Scheduled to open in 2019, it will displace the existing lock as the largest facility of its kind in the world. “The new lock will be deeper, wider and longer. It will also improve the already excellent reliability of the port in that it will ensure that vessels can continue to access terminals if one lock is temporarily closed for maintenance,” notes de Ridder. As ever with agribulk, tonnage rises and falls in relation to a constantly shifting trading environment, which is, in turn, impacted by global harvests. “In recent times, agribulk traffic has seen a notable shift away from the European market, with more and more commodities sourced from South America and the Far East,” says de Ridder. especially now that investment is planned by the port authority in new flat warehousing facilities. Over the last 20 years, de Ridder adds, agribulk has become one of the port’s main dry bulk sectors. In the 1990s, volumes grew from 5mt to 10mt, declining just slightly to 8.5mt in 2013. Much of the strength in this area is down to the presence of two major stevedores — IGMA and OBA — which are the most important regional players in this market, something which has allowed them to increase their market share. Since agribulk tends to be a relatively light material, no lightering is required outside the locks, with Handy and Panamax size vessels passing directly to the facilities in the main port. Amsterdam also benefits from a local processing sector for inbound agricultural products, with 3mt of mainly soya and oil seeds imported. Amsterdam retains a strong position as something of a regional hub for building materials for companies in north-west Europe. These are mostly sea-dredged aggregates, sourced from both Scotland and Scandinavia. However, this year, the port has seen something of a slow down, although expectations are for a recovery. “The construction sector in north-west Europe has been a bit sluggish in recent times, although we are beginning to see signs of recovery and forecast more grow in the near future,” says de Ridder. Such commodities, he suggests, are also relatively captive to the port, since Amsterdam has been able to leverage its strategic location to rotate consignments out by barge to various localities across the Netherlands and also into Germany. Given a draught of 17.8 metres, Amsterdam can also accommodate bulk carriers of up to 170,000dwt, which are typically deployed on aggregates traffic. In this sector, producers tend to operate their own, very large bulk carriers on what are, essentially, pendulum services, connecting the same origin and destination port. Indeed, next year, Amsterdam is to start receiving consignments of granite from both Scotland and Scandinavia in such bulk carriers, which will definitely require lightering at IJmuiden. In terms of landside movements at Amsterdam, 20% goes by rail, around 70% by inland waterway to Germany or by coastal vessels to the UK, with the remaining 10% processed in the port. 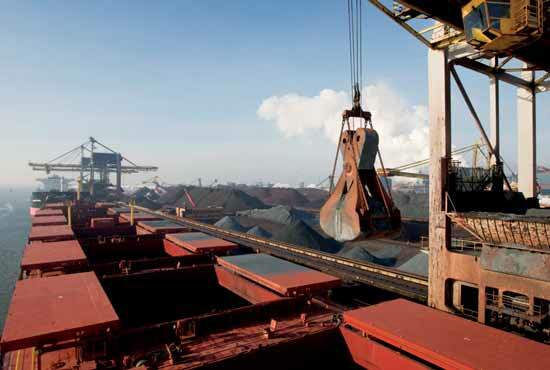 “Dry bulk isn’t really suitable for road shipment anyway,” says de Ridder, noting that this particularly healthy situation has evolved naturally, taking advantage of the port’s unique position and infrastructure to ensure trucks are kept off the road. Terminal operators, too, recognize the importance of intermodal options, with OBA, in addition to recently revamping its conveyor system, also improving equipment at its rail head to expedite deliveries. However, de Ridder also emphasizes the presence of nearby Schiphol airport, around ten minutes’ travel time away from the port, since this makes it easier for all concerned to access the port without having to rely on other modes and has undoubtedly contributed to the success of the port, too, he says.